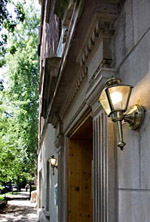 640 W. Briar is a distinctive three-story walk up building built in 1920 and offers comfortable and affordable apartments. An ideal location, 640 sits one block south of Belmont between Halsted and Broadway in one of Chicago's most interesting, eclectic neighborhoods offering numerous shops, cafes, bookstores, and restaurants within walking distance. The apartments are efficiency studios ideal for people with an active lifestyle. Parking is available on site, and with all utilities included, the residents pay only internet and cable with the rent. 640 makes living simple and affordable in a great neighborhood!